FARGO, N.D. – RDO Equipment Co. and its parent company, R.D. 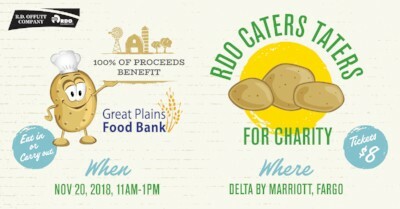 Offutt Company, are pleased to announce the Great Plains Food Bank as this year’s benefiting charity of RDO Caters Taters for Charity. The annual potato luncheon will be held Tuesday, November 20, from 11 a.m. to 1 p.m. at Delta Hotels by Marriott Fargo. The Great Plains Food Bank's mission is to end hunger in North Dakota and western Minnesota through community partnerships. It is the largest hunger-relief organization in North Dakota and serves as the state’s only food bank. Each year, the GPFB touches the lives of 1 in 9 individuals who seek emergency food assistance. RDO Caters Taters for Charity, now in its 19th year, has raised more than $580,000 for local charities including American Cancer Society, Make-A-Wish of North Dakota, Hospice of the Red River Valley, Sanford Children’s Hospital, Special Olympics North Dakota, Project Ignite Light, Big Brothers Big Sisters, Anne Carlsen Center – Fargo, YWCA Cass Clay, and most recently, CCRI, Inc.
Visit rdocaterstaters.com for more information on the event. Like the Facebook page and follow RDOCatersTaters on Instagram for the latest event news and special photos. R.D. Offutt Company is a family-owned and -operated company comprised of several business entities in the agriculture/construction equipment, farming, and food production industries. Now it its 35th year, the Great Plains Food Bank serves as North Dakota’s only food bank. Its partner network includes 213 food pantries, shelters, soup kitchens, and other charitable feeding programs operating in 99 communities across N.D. and Clay County, Minn. Since 1983, the Great Plains Food Bank, through its partners and programs, have distributed more than 185 million pounds of food to children, seniors, and families in need. The Great Plains Food Bank is a member of Feeding America, the nation’s food bank network and was named the Not-for-Profit of the Year for 2017 by the Fargo-Moorhead-West Fargo Chamber of Commerce.